If I’m 100% honest, a little part of the reason I didn’t complete the defensive charts for the Ohio State game last week was that I hoped by combining those charts with the Iowa charts, I could maybe have some good to offset the bad from the Ohio State game. Aside from Robinson, the only regular rotation player to miss the entire game was true freshman safety Devon Matthews. As we’ve discussed, Matthews is a frequent sub in passing situations. Given the secondary’s struggles in coverage on Saturday, it’s safe to say that Matthews’ absence was felt. In the 1st quarter, 2nd team WLB T.D. Roof pulled up lame while in coverage on a deep pass that fell incomplete. It looked like a pulled hamstring. He did not return, and Coach Allen mentioned during the week that he is being monitored. In his absence, Raekwon Jones saw a higher percentage of snaps than normal, and Micah McFadden also saw the field a bit more. We knew going in to the Ohio State game that IU would likely play quite a bit of zone, given the difficulty/impossibility of sticking with OSU’s athletes in man coverage. For the 2nd year in a row, Ohio State carved up IU’s zone coverage to the tune of 14 catches for 212 yards and a TD. In 2017, OSU beat IU’s zone for 4 catches, 178 yards and 2 TDs. In general, IU actually did a slightly better job of keeping OSU’s receivers in front of them[ref] With the glaring exception of the short pass to Paris Campbell that turned into a long TD due to a coverage bust. [/ref], but man were there gaps to be had. Coach Allen’s gameplan was obviously much different against Iowa. The IU secondary played far more man coverage…and the end result was just about the same: over 300 yards passing and 6 TDs allowed. I said earlier this season that for this defense to maximize its potential, Jonathan Crawford and Marcelino Ball would have to become playmakers. Through seven games, neither has really stepped into that role. Crawford forced a fumble and picked off a pass in the opener against FIU and hasn’t created another turnover since. Ball has a couple sacks and one forced fumble. Between the two of them, they have 3 total passes defensed. In the past two games, the duo has given up 122 yards and 4 TDs through the air, while also being flagged 3 times. Obviously, the matchups have been difficult the past two weeks – elite speed at wide receiver for Ohio State and two NFL tight ends for Iowa – but IU’s best defenders have to perform better. Ol’ Andre Brown’s hot start to the season has seen some regression to the mean. In the past two games, IU’s most experienced corner has given up 95 yards and a TD on 7 targets (13.6 YPT) and was called for defensive holding. After being called for 4 pass interference or defensive holding penalties against FIU, the secondary had reined in its penalty problem, only drawing 4 total coverage penalties in 5 games since. But the problems came back in a big way against Iowa, with 5 coverage penalties. While I wasn’t in love with a few of the calls, there is no doubt that some technique issues that need to be cleaned up in this area. The blitz charts show the vastly different gameplans for these two games as well. Against Ohio State, Coach Allen was content to sit back in coverage, rather than risk getting gashed on big plays by Dwayne Haskins and his stellar receiving corps. Surprisingly (and sadly), IU’s 11% pressure rate is not a season-low. That (dis)honor goes to the 9% pressure rate from the FIU game. On the other hand, against Nate Stanley and Iowa, Allen opted to turn up the heat. The 74% blitz percentage matches the previous high in the 2.5 seasons I’ve been tracking this – IU also blitzed 74% of the time against Penn State in 2016. The 35% pressure rate is a season high for the Hoosiers and is above average for Coach Allen’s defenses while he’s been at IU. In fact, for a stretch in the 2nd quarter, IU generated pressure on 8 of 11 drop-backs. In an otherwise utterly forgettable performance, that’s actually pretty darn good. That said, these games also show that not all pressures are created equal. While pressures were few and far between against Ohio State, 2 of IU’s 5 pressures directly contributed to interceptions. Against Iowa, however, Marcelino Ball was credited for a pressure after getting a clean run at Stanley on a blitz. Had he completed the sack, Iowa would have faced a 2nd and 23 from outside IU’s 20, and IU would have been looking at a 17-10 deficit midway through the 2nd quarter. [ref]Assuming Iowa settled for a field goal. [/ref] Instead, Stanley got away and threw a TD pass. 21-10 Hawkeyes. BRUTAL. One quick positive note: true freshman defensive end James Head is going to be very good. His combination of size and athleticism is uncommon anywhere, but it’s especially rare at IU. While his on-field production isn’t quite showing up in the stats yet, he’s already a valuable player for this defense. One example from the Iowa game: Head dropped into coverage – already a notable act for a 250-pounder – read a screen pass to the running back, ran a good 10-15 yards and brought down the back milliseconds after the ball arrived for a loss. Aside from IU’s three takeaways, the main positive to come from the defense’s performance against Ohio State was the effort against the run. The Hoosiers mostly neutralized an Ohio State running game featuring two excellent backs in J.K. Dobbins and Mike Weber, including limiting them to less than 4 YPC on runs between the tackles. That performance and the struggles of Iowa’s running game for the first half of the season gave me hope that IU could render the Iowa offense one-dimensional. Nope. While Nate Stanley and the tight ends put up gaudy numbers, IU’s inability to slow down Iowa’s running game was arguably more disappointing. It is very difficult to win a football game when you give up 6.4 YPC on 15 carries inside the tackles. And finally, the tackling against Iowa was a significant issue. Like pressures, not all missed tackles are created equal. Several of the missed tackles against Ohio State came in the backfield and the rest of the defense quickly cleaned up the mess. Against Iowa, in addition to the Ball miss described earlier, Juwan Burgess, Thomas Allen and Bryant Fitzgerald all missed tackled on touchdowns. 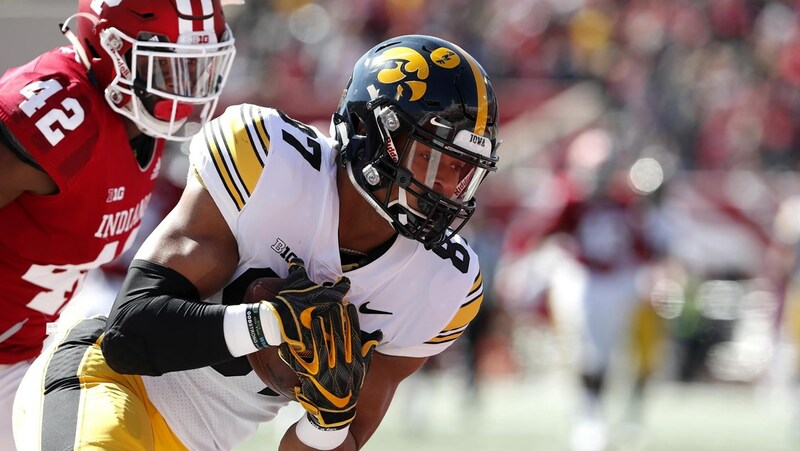 Nate Stanley, Noah Fant and T.J. Hockenson are hard to tackle, but that’s the reality of life in the B1G. This week, Trace McSorley and Miles Sanders aren’t exactly easy to bring down. IU will have to do much, much better on the tackling front if the Hoosiers want any shot at pulling the upset.